In a bold move to free Edo people and residents from the stranglehold of the inefficient Benin Electricity Distribution Company (BEDC) and undo the endless cycle of darkness foisted on electricity consumers in the state, Governor Godwin Obaseki on Wednesday, visited the 55 Megawatts CCETC-Ossiomo Power plant as the facility prepares to commence operation. The governor added: “We are concluding transaction to light up 200 Kilometres of our streets across the city. When the plant is completed, it will free up some electricity for the state. We believe that if the megawatts produced increase, the distribution company will have more power to distribute to other cities in the state. 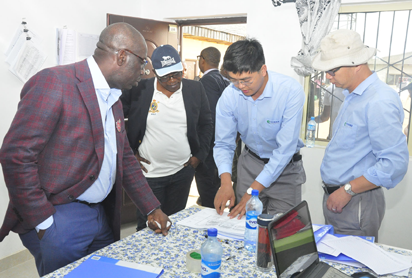 Director, CCETC Clean Energy/Ossiomo Power Plant, Dr. Uwa Igiehon, said the power plant is a joint venture between a Chinese Company, CCETC Clean Energy and Ossiomo Power to build a 55Megawatts plant in the state. He said the power plant started in August 2018 and would be delivered in the next four to five months. The governor was also at the 1800-housing unit Emotan Gardens on Upper Sokponba Road, to see the extent of work at the estate.